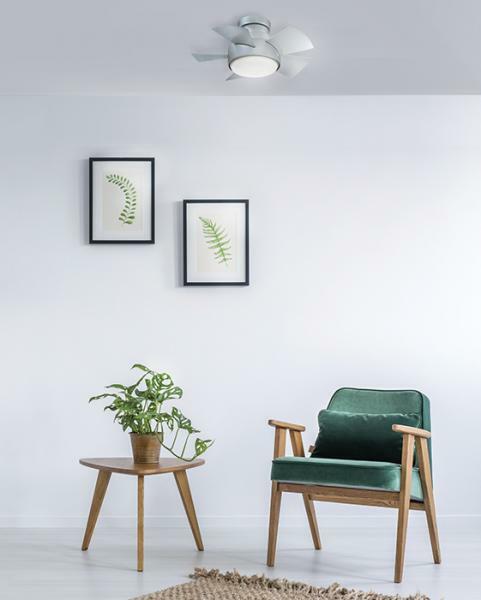 Vox, from Port Washington, N.Y.-based Modern Forms, is a smart ceiling fan that is designed for small rooms or for multiple placements in larger spaces. Able to be installed in wet locations, the fan features aluminum hardware, ABS blades, integrated LEDs (powered by WAC technology), and a high-efficiency DC motor, which operates quietly and is 70 percent more efficient than traditional AC-style unit, the manufacturer says. The fan also integrates smart home features and is compatible with other systems such as Google Assistant, Amazon Echo, Nest, and ecobee. Vox utilizes smart Adaptive Learning Technology that was developed by WAC Lighting, the company says. This feature makes life easier every day by suggesting optimized schedules. The fan comes in bronze, matte white, or titanium silver. One RF wall panel is included with unit for local control, but additional panels are available for three- or four-way control.